Yokoyama Taikan, a giant of modern Japanese-style paintings, painted “Yamaji” when he was 43 years old (in 1911, stored by Eisei-Bunko Museum and deposited by Kumamoto Prefectural Museum of Art). It is an important piece in which Taikan heavily used the “touches”, a reputed technique consisting of the blending of the Western impressionist school and the Southern school of Chinese painting at the time the piece was made public. It was the vanguard of the ‘new Nanga-style painting’, prevalent in the Taisho Period, escaped from the hazy style attempted by Taikan in the Meiji 30’s (1897). In addition, Mr. Arai Kei (Tokyo University of the Arts) recently pointed out that ‘Yamaji’ likely used mineral pigments, which were new at that time. This painting is thus noteworthy even when examining the materials used in Japanese style paintings during the era. 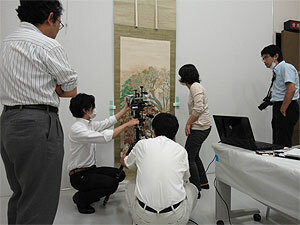 On the occasion of the restoration of “Yamaji”, the Eisei-Bunko Museum, which owns the painting, and our Institute will begin joint research, conducting many-sided investigational studies with Mr. Miyake Hidekazu of the Museum. To start with, on October 10th, we conducted near-infrared reflectance photography and qualitative analysis using the fluorescent X-ray analysis method at the Kumamoto Prefectural Museum of Art where ‘Yamaji’ has been deposited This was done together with Mr. Arai mentioned above, Mr. Taira Yuichiro (Tokyo University of the Arts) and Ms. Ogawa Ayako (Tokyo University of the Arts), in cooperation with Mr. Hayashida Ryuta at the Kumamoto Prefectural Museum of Art. The result of research revealed that ‘Yamaji’ consisted of an abundant amount of modern pigments, which are different from conventional pigments. The restoration will continue for a period of one year. We will gather the obtained survey results; the progression status of the restoration, and various types of information that include reviews from the time the work was made public. We would like to release such items publicly as fundamental materials. The Department of Research Programming of this Institute holds a public lecture every autumn in order to disclose the results of our research on art history. This public lecture is the 44th with the first held in 1966. Since 2006, we have established a common theme titled “The Dynamics of Interaction between Objects and People”, and four researchers from both within and outside the Institute gave presentations on October 15 and 16. 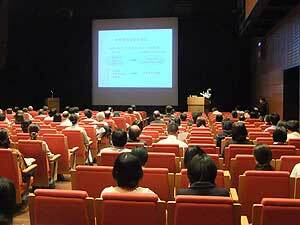 On October 15, Mr. Tsuda Tetsuei (the head of Archives Section of the Department of Research Programming) gave a presentation, entitled “Creation of the statue of the virtuous founder of Shinran School on the Amida Rure Land Buddhism in the medieval period”, on the background of the creation of the life-sized statue of the school successors and the meaning of the creation of the statues. Dr. Suga Miho (associate professor at Okayama University) gave a presentation entitled “Beauty of flowers and grasses – Space of pavilions at the Tsuku-busuma-jinja Shrine”, and clarified the formative expression and space configuration based on the detailed investigation of pavilions while using a great deal of pictures. On the following day, Mr. Takahashi Toshiro (curator at the Naritasan Calligraphy Museum) gave a presentation entitled “Imperial Court Poets and Calligraphy”, and clarified the cultural role of the activities of poets whom gathered in the Imperial Court of Poets (opened in 1888), in terms of the background pertaining to the maintenance and expansion of the modern imperial system. Mr. Shioya Jun (Head of the Art Research Materials Section at the Department of Research Programming) gave a presentation entitled “Akimoto Shatei and Japanese-style paintings in the Meiji Period”. He focused on the activities of Akimoto Shatei, a brewer in Nagareyama who played an important role as a supporter of Hishida Shunso as leader of Japanese-style paintings in the Meiji Period. 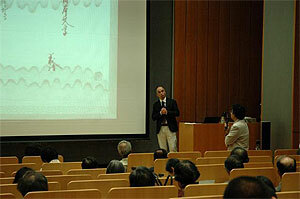 During the presentation he clarified the reception to artworks during the Meiji Period. We had 114 and 86 audiences respectively on each of the two days. On the first day, Mr. Itsuo Ikushima, the Chief Priest of the Chikubushima-jinja Shrine and his wife, attended in relation to the presentation of Dr. Suga. On the second day, Ms. Akimoto Yumiko, a water-color painter and the grandchild of Akimoto Shatei attended in association with Mr. Shioyas’ presentation. 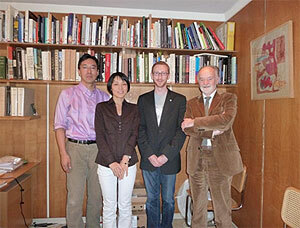 Mr. Itsuo Ikushima and Ms. Akimoto Yumiko answered the questions from the hall and the public lecture ended successfully. From the results of the questionnaire performed after the lecture, we have learned that the audience was very satisfied with the content. 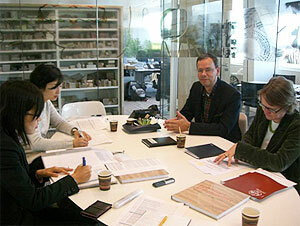 We would like to actively plan for the transmission of the results of research conducted by our institute. 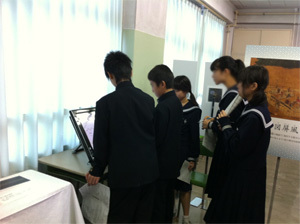 Students were looking at the explanation of National Research Institute for Cultural Properties, Tokyo on a touch panel. On October 30th, the National Research Institute for Cultural Properties, Tokyo exhibited panels at a school festival at Ueno Junior High School in Taito-ku, Tokyo. We displayed two subjects: The clarifying of the structures of nohkan and ryuteki flutes by X-ray photography, and the survey and investigation of Buddha statues by X-ray photography. 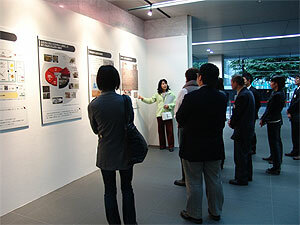 The panels previously exhibited at the entrance of the Institute were reused, and both subjects were investigated using X-ray photography and results were seen. Students at the junior high school know well that the state of ones chest can be revealed by X-ray photography during physical checkups. Therefore, we think that they understood what material of cultural properties this method is effective for and what can be revealed with the research results. This is the second time that the panels of the Institute have been exhibited at the school festival at Ueno Junior High School in Taito-ku, Tokyo. 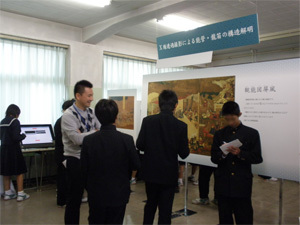 Although the exhibition was on display for only one day, it provided a good opportunity for approximately 300 Ueno Junior High School students, teachers, and guardians to know that a research organization which protects cultural properties and hands them down to future generations exists near Ueno Junior High School. We hope that this activity will continue cooperation with school education and with the local community. We reported in Tobunken News Vol. 36 that, among the books of the late Professor Suzuki Kei (passed away on October 18, 2007), the leading authority on Chinese picture history and Professor Emeritus at Tokyo University, the “Wenyuange Edition Siku Quanshu”, “Si Bu Cong Kan Chu Bian Suo Ben” and “Da Qing Li Chao Shi Lu” were offered by his bereaved wife Teruko to the Institute in December 2008. On October 26, Ms. Suzuki Teruko additionally donated the series of publications – “an authorized collection of all-time books” and “Tien-i-ko tsang Ming-tai fang-chih hsuan-kan”. 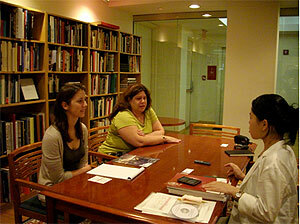 These donated series of publications enrich the library of the institute. We will arrange and register them in sequence so that many people can read and make use of them. From October 5th (Tuesday) to 13th (Wednesday), researchers of the Center for Conservation Science and Restoration Techniques conducted a workshop related to the restoration of paper cultural properties at the lecture room of National Berlin Asia Museum in Berlin as part of the Cooperative Program for the Conservation of Japanese Art Objects Overseas. The workshop held this year consisted of three courses – the basic course (20 people), the beginners’ course (12 people) and the intermediate course (7 people) – on hanging scrolls, targeting conservators at museums and art museums, and restorers of paper. 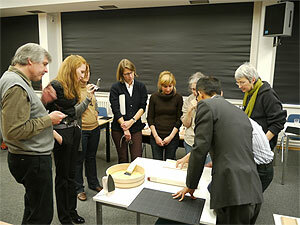 In the basic course, a lecture was given on paper, adhesive and restoration, and conservation. In the beginners’ course, the structure and handling of hanging scrolls was explained using a model and practical training on the coloring of silk was conducted. In the intermediate course, practical training on removal and attachment of top and bottom axes and string attachment was conducted. The workshop was received well by the participants as a fulfilling workshop. In recent years, requests for cooperation and emergency assistance concerning cultural heritages damaged by natural disasters have been increasing, and an effective execution of international cooperation for restoration of damaged items of cultural heritage has been more and more important. Therefore, the Japan Consortium for International Cooperation in Cultural Heritage is now surveying the collaborative structure of relevant organizations and surveying supporting countries on how to perform emergency treatment. We have interviewed a total of 27 organizations in USA (on August 17th-26th), Netherlands and France (September 26th – October 8th) up to present, focusing on the administrative, civilian and international organizations. In the USA, it became apparent that flexible treatment was performed during the Haiti Earthquake, making use of personnel dispatch systems to damaged items of cultural heritage and the information association network which had been functioning beforehand in USA. In the Netherlands it was revealed that the division of roles of each organization was clear and the content of support was specialized in small-scale financing assistance immediately after disasters occurred. Meanwhile, we found out that in France, the Ministry of Foreign Affairs has been putting emphasis on the cultivation of emergency support specialists (urgentistes) in cooperation with NGOs. This is in order to further strengthen the conventional cooperation system network. Enhancing readiness for disasters that occur sequentially is a common issue in Japan, and we acquired useful information through a series of research when considering the Japanese international cooperation system. The current state of registered buildings in the historic area. A sound building, a repaired building, one left without intervention, one demolished with a fence installed (from left to right). In the framework of the Cooperation Project for the Rehabilitation of Earthquake-affected Cultural Heritage in the historic district of Padang in West Sumatra, Indonesia, commissioned by the Agency for Cultural Affairs, we have been conducting activities to support Padang. 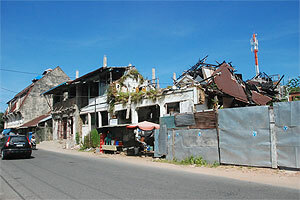 The city suffered severe damaage from the earthquake of September 30, 2009. Our support consists in integrating together with local bodies the protection and conservation of cultural heritage within the more general urban reconstruction process. As a first step in a series of surveys and activities to be executed until February 2011, we conducted a field survey on the state of restoration of historic buildings and twonscape from October 16 to 25. In this survey, we recorded the current status of the town one year after the earthquake, taking the data of the damage assessment survey of November 2009 (immediately after the earthquake) as basis for comparison. Although the rubble had been cleaned and the bustle of the town had returned, the state of restoration of the buildings that make up the historic townscape was varied. The number of registered heritage buildings, whose restoration had advanced was very limited, and many buildings were left untouched since the earthquake; some lots had been cleared completely. In the discussions with the governor and the local organizations concerned, our understanding matched in that the protection of cultural heritage contributes to the reconstruction of the town and that the cooperation of specialists, government and residents is important. We will thus continue working with local specialists, cooperating with the central, state and city governments. An on-site workshop on written cultural heritage is planned for November, and workshops on historic buildings and townscape will be held in December and January in Padang. Immediately after our survey team returned from its mission, an earthquake and tsunami hit West Sumatra again. Although Padang did not seem to have suffered heavy damage, this disaster strengthened our desire to contribute to the reconstruction of the town and the maintenance of a safe living environment through the protection of cultural heritage. 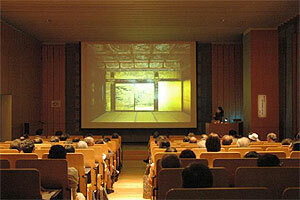 The Japan Center for International Cooperation in Conservation have used the government subsidized budget for the Cooperative Project for the Conser-vation of Cultural Heritage in West Asia and UNESCO/Japanese Funds-in Trust and invited Iraqi conservation specialists to Japan every year since 2004 for training on conservation of cultural heritage. This year three specialists in conservation – Ali Ganim, Nafla Nabil and Fadil Abdul Hadi – have been invited from the Iraq National Museum, and training will last for about three months from September 22nd to December 9th. They are to receive training on equipment for the conservation of cultural properties, lectures and practical training on conservation of wood products and metal products. It is also planned that they visit the National Research Institute for Cultural Properties, Nara, the University Museum, the University of Tokyo, The Institute for Cultural Studies of Ancient Iraq, Kokushikan University and the Hitachi High-Technologies Corporation.